Gum disease, also known as periodontal disease, is a major threat to your health and wellbeing. Your best bet when it comes to treating gum disease is to act as soon as you can and begin addressing the problem. The sooner your dental team can figure out what is causing your gum and teeth issues, the sooner they can work out a treatment plan that is right for you. The most common course of action for treating periodontal disease is a process known as dental scaling and root planing. At Loop Perio, we offer a range of gum disease treatments that can help you with your day to day dental care routine. If caught early and treated, periodontal disease and its effects can be drastically decreased with proper gum disease treatment and continued maintenance. If left untreated, periodontal disease can lead to tooth and bone loss. Gingivitis can be one of the first signs of infection and gum disease. The build-up of bacteria that is causing the inflammation of your gums comes from plaque. If the plaque is not brushed away properly, it hardens into tartar/calculus, which cannot be removed with normal brushing. The bacteria in the hardened plaque starts to eat away at the connective tissue between your teeth and gums. This causes the creation of “pockets”. At this stage, the effects of periodontal disease are still often reversible. In some patients, their gum disease is diagnosed early enough to where they can avoid needing gum surgery. Instead, their gum disease can be treated with a special deep dental cleaning called scaling and root planing. This is just one of the many dental procedures we specialize in here at Loop Perio. Treating gum disease is a team effort, and your dentist is a major player. They will be able to give you the care you need and help you take care of your teeth before and after your scaling and root planning procedures. Performing dental scaling and root planing can be done only after a thorough examination has been done of the mouth. This involves x-rays to determine if there is bone loss as well as visually examining the mouth. Depending on the condition of the gums, the level of infection, how much damage has already been done, and any other health concerns present, local anesthesia may be used during the procedure. Treating gum disease can be a big deal, but our team at Loop Perio can help you determine the right treatments for your unique needs. We are here to help and to answer any questions you may have about dental scaling and root planing. Scaling and root planing teeth, provided by either your dentist, hygienist, or periodontist may take more than one appointment to complete. A local anesthetic is often used to minimize any discomfort. The procedure involves thoroughly scaling all plaque, bacterial toxins and tartar deposits from your teeth and root surfaces; and then root planing, which smoothes all rough areas on your roots’ surfaces. Smooth root surfaces keep bacteria, plaque and tartar from easily re-adhering underneath the gumline which reduces the inflammation, allowing your gums to heal and reattach themselves more firmly. Other treatments may be given at the time of the treatments, antibiotics, surgery to stop bone loss or regenerate bone, and future treatments for missing or damaged teeth. Just one call is all it takes to set up your consultation appointment and then you can see for yourself how treating gum disease is easier with our periodontal team on your side. Taking care of your teeth and gums can help prevent disease. Research has shown time and time again that the explosion of bacteria that cause periodontal infections impact more than just your teeth and gums. The infection can quickly and relatively easily travel through the blood stream and affect other areas of the body. The heart is most susceptible to this bacterial infection, but scaling and root planing help remove disease causing bacteria and your home care keeps them from coming back. Another benefit of treating gum disease with scaling and root planing is that it helps protect against tooth and bone loss. When gum pockets get too deep, they become hard to clean properly. This allows bacterial colonies to get established and spread. Toxins from the bacteria eat away at the bone that is anchoring the tooth in place, and this can then lead to tooth loss. In severe cases, the very structure of the jaw can be compromised as the infection eats away at the bone and tissue. 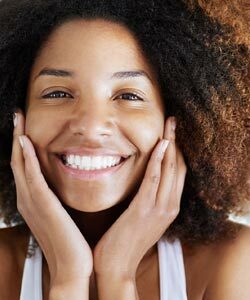 Finally, scaling and root planing goes a long way to give you a more aesthetically pleasing smile, by reducing the inflammation which causes tender, red and puffy gums. It can also help correct halitosis. Superficial stains on the teeth will be removed during the procedure which is another added benefit that gives you a better-looking set of teeth. You can keep your teeth and gums healthier in the long run once the treatment is done because it will be harder for bacteria, plaque, and tartar to attach to your teeth and gums. If you have questions about good dental care in general or whether you need scaling and root planing, give us a call!